Can podcast production companies be startup incubators for comedians? Scott Aukerman’s been making people laugh since long before the digital age. As a writer for HBO’s Mr. Show in the mid-90s, he helped pioneer the kind of awkward anarchy perfected by Zach Galifanakis and Adult Swim favorites like Tim and Eric. But his latest success story is one that could only happen on the web. While guys like Jerry Seinfeld used to land TV deals based on their standup routines, Aukerman will star in a TV show based on his success in a field that’s quickly becoming a new breeding ground for the future stars of comedy: podcasts. Tonight, Comedy Bang! Bang!–based on Aukerman’s podcast of the same name–will premiere on the IFC Channel. For the uninitiated (if they still exist), a podcast is essentially a radio show that is native to the web. They can be downloaded and played back as MP3s, or streamed online to computers, smartphones, or tablets. There are cooking podcasts, politics podcasts, even podcasts devoted to the supernatural, and some of the most popular ones are comedy podcasts like Aukerman’s. Started in 2009 as Comedy Death-Ray, Comedy Bang! Bang! is a variety show featuring improvised conversations with fellow comedians including Patton Oswalt, Aziz Ansari, and “Weird Al” Yankovic. 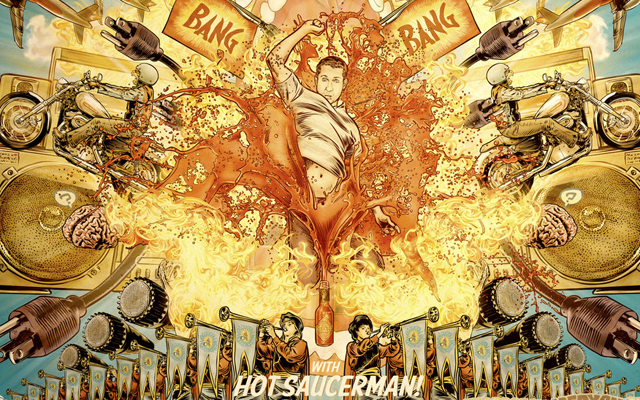 As an interviewer, Aukerman might be described as the anti-Jay Leno, encouraging guests to embrace their weirdest tendencies and never letting the truth get in the way of a funny joke. In a recent episode, Tim Heidecker recalls wearing prosthetic eyes for a new Woody Allen movie starring Jackie Chan as Bill Clinton. In other words, this isn’t the place celebrities go to plug their latest project. Fast Company profiles the personalities behind the ideas that shake up business as usual. Discover more about these pioneers here. The format hasn’t changed much in its transition to the small screen: Aukerman still interviews celebrities both real and fake, and its inaugural season will include visits from Jon Hamm, Amy Poehler, Seth Rogen, and Elizabeth Banks. The biggest changes to the program are the addition of Reggie Watts as co-host and bandleader (or more accurately, just band; Watts plays all the instruments himself) and a visual sense that combines the deceptive coziness of Between Two Ferns With Zach Galifinakis (which Aukerman directed and co-created) and the unhinged playfulness of Pee Wee’s Playhouse, replete with talking inaminate objects. Beyond these tweaks, the strange, hilarious balance of affability and awkwardness that Aukerman cultivated on the podcast remains intact. In this sense, podcasting is more than just than a launchpad to success. It’s also an incubator where comics can hone their craft without having to answer to millionaire television or film producers. With this in mind, Aukerman co-founded Earwolf two years ago, a podcast production company which functions a bit like a startup accelerator for comedians. Describing his role there, Aukerman says, “I develop new podcasts, I work with the creators to shape them and form them, but I’m also in there trying to figure out new avenues to explore like, ‘Can some of the shows be turned into television programs? Can they be movies? Can they be huge blockbuster 3-D movies?’” Journey to the Center of Scott Aukerman’s 3-D Brain coming to a theater near you. Podcasting may be a new avenue to the big leagues (see: podcasting genius Marc Maron, whose television pilot is set to land on IFC in 2013), but it’s obviously not the only route. Between web series, podcasting, and Twitter-first joke-writers like Rob Delaney and Megan Amram, comedians have never had so many creative outlets or chances for exposure. But Aukerman emphasizes that these tools can only go so far in helping a comedian’s career.